Check Out This Weird, Shiny Rock on Mars Spotted by the Curiosity Rover! 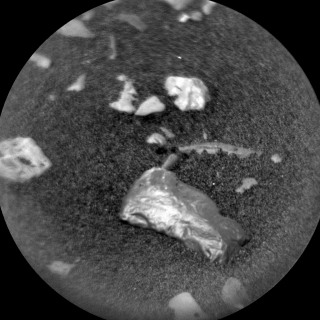 The Curiosity rover on Mars has spotted an unusually shiny rock, which the scientists running the rover think could be a meteorite. We're all distracted by shiny things sometimes, and NASA's Curiosity rover on Mars is no different. At the end of November, the rover spotted a rock that has since been nicknamed "Little Colonsay." In initial photos of the rock taken by the rover, Little Colonsay appears unusually shiny, leading scientists on the team to suspect that it could be a meteorite that crashed into the surface of Mars. "But looks can deceive, and proof will only come from the chemistry," one mission scientist wrote in an update on NASA's blog for the rover published on Nov. 28. The team told Curiosity to try studying the rock in more detail, but the rover wasn't quite able to do so by the time the update was published. The team would like Curiosity to try again but did not specify when that might happen. Meteorites are tricky to identify on Earth as well, but here, looking for something shiny isn't the best tactic. That's because as a hunk of asteroid traverses Earth's thick atmosphere, the object's outermost layer is melted and charred, giving the meteorite a dull black coating called a fusion crust that fades to brown after the rock's entry. Mars' atmosphere is much thinner. Chemical analyses are also used on terrestrial meteorites. While Curiosity's ChemCam instrument has been busy with Little Colonsay, other instruments on the rover are drilling and sampling other nearby rocks and the rover's environmental sensors are checking out the surrounding area.